Using Account Manager, you can view your statements for the last 18 months. SMB users see the following version of the Billing page. Enterprise users see the following version of the Billing page including Billing Preferences and Cost Centers. Select the Currency from the drop-down list under Activity Since Last Payment. Your selection determines the type of currency for your statement. Note: You can select from the following currencies: British Pound Sterling, Canadian Dollar, US Dollar, Australian Dollar, and Euro. The following is a statement for a single bill. The following is a statement for multiple bills. 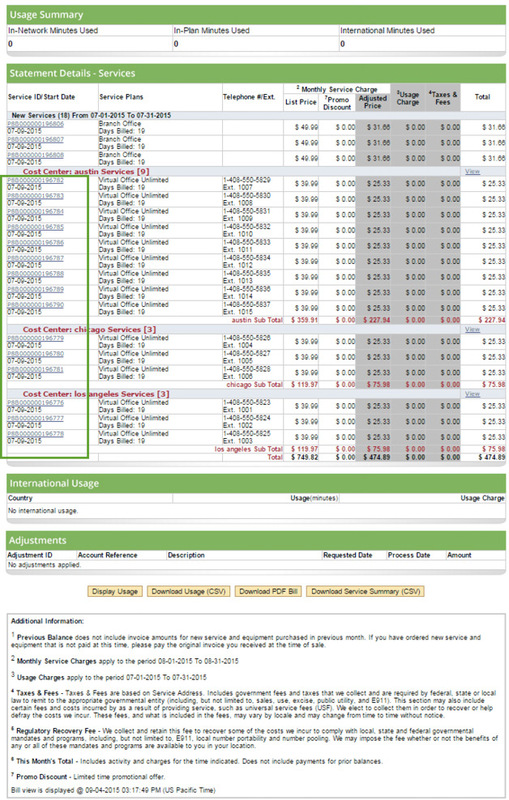 A detailed billing summary displays. Below is an example of an enterprise consolidated statement with cost centers in Austin, Chicago, and Los Angeles in US dollars. To view billing details for a particular extension in Billing > Statements, click View next to the corresponding extension. To see account activity since your last payment in Billing > Statements, click View Activity. A detailed billing summary opens. This feature allows you to select whether you receive a consolidated or unconsolidated bill for your telephone extensions and allows updates to your payment details. Unconsolidated Billing: If you have chosen unconsolidated billing, you receive multiple bills per billing cycle, one for each of your 8x8 services. The selected credit card is charged for each service independently. Consolidated Billing: If you have chosen consolidated billing, you get one monthly bill for all your 8x8 services, and your credit card is charged once for the entire amount owed 8x8. SMB users: If you are an SMB user, you can select unconsolidated or consolidated billing and switch between the two billing types as desired. Enterprise users: If you are an enterprise user, moving from unconsolidated billing to consolidated billing cannot be reversed. Please note that you must select consolidated billing to create cost centers. 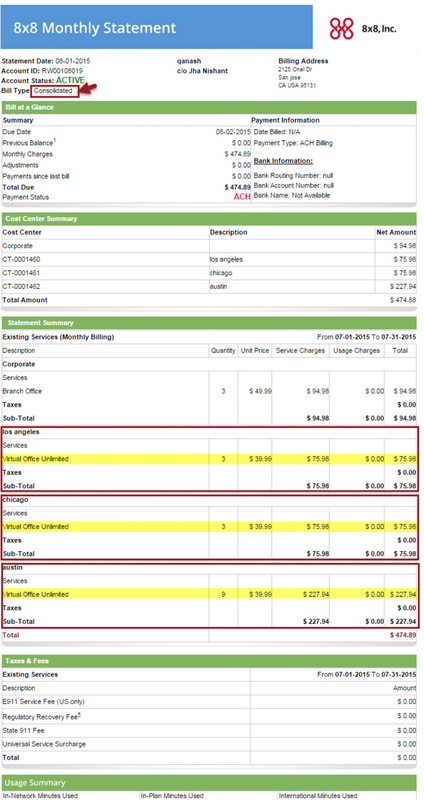 In Billing Profile, SMB users can change their billing type from unconsolidated to consolidated. Enterprise users, however, can add or edit their payment options in Billing Profile. They can select their billing type by navigating to Billing Preferences. For details, refer to Billing Preferences. Under the Billing menu, click Billing Profile. When the dialog box appears, select the payment method for consolidated payment from the drop-down menu. When the confirming dialog box appears, click Ok to confirm the change. Your billing is now consolidated under one credit card. For consolidated SMB accounts, select another payment type from the list, and click Select. Click Delete or Edit, if applicable. Note: At least one credit card must be active at all times. If you are adding a new credit card, click Add Credit Card. Fill in the information for the new credit card. 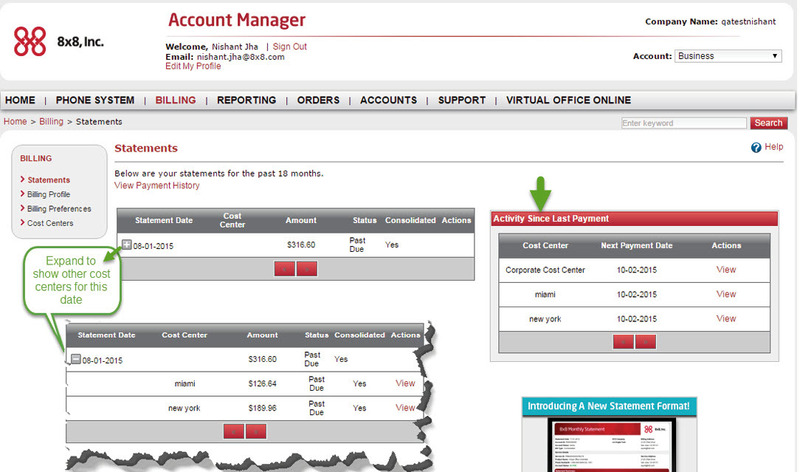 -For unconsolidated SMB accounts, in Update Payment Billing Info, click Update. -Select the payment type from the listed options. You can also add a new credit card or delete an existing one.